Tired of Dealing with Truck Rentals? 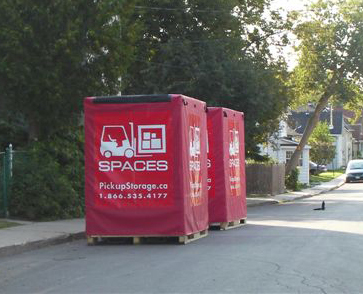 Spaces Storage portable storage containers are perfect for those who don’t want the hassle and expense of dealing with U-Haul and other truck rental companies. Our portable storage containers eliminate the need to rent or borrow a truck, trailer, movers etc. You do everything at your home, at your own pace. We will deliver our storage containers right to your home or work. You can pack it up taking as much time as you need and when you are done, you can call us and we will come remove the container. We will then transport the storage unit to our secure facility where it will sit until you are ready for it. If you need to access anything in your unit before you are ready to unpack just give us a call (48 hours’ notice please) and we will deliver the container to the address you specify OR you can access it at our location. We are flexible and are willing to work with you in any way. We are here to help and always want to make our customers happy and satisfied. Ever Had A Moving Company Break Your Items? Everyone who has ever hired a moving company can remember when one or more of their precious belongings ended up broken due to the carelessness of movers. Don’t let this happen to your possessions. With Spaces Storage you pack the container yourself at your pace so you know your items will be secure and safe. Our portable storage solution is the only way to guarantee the safety of all of your belongings. We will leave our portable storage container on your property so you can take your time organizing. This is the only way you will know for sure that all of your breakable items have been safely packed and loaded. For optimal security we recommend wrapping your important items in blankets, bubble wrap or newspaper. To see more of our helpful packing tips click here. Not Sure How Much Storage Space You Are Going To Need? At Spaces Storage we only charge you for what you use. If you order 3 portable containers but only fill 2 we will remove the third container at no cost to you. Each portable storage vault measures 8’ x 5’ x 8’ and can hold 1-1.5 rooms of furniture to a maximum of 2000lbs. We can deliver up to a maximum of 6 portable storage vaults in one trip. If you require more we can deliver extras at no extra cost to you. With our portable storage solution you get no hidden fees, timely and professional customer service, an innovative option to storage, and complete flexibility. Don’t waste your time on U-Hauls and movers. Call us today!